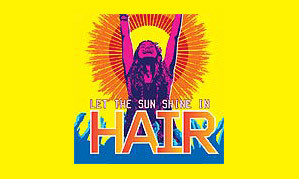 On Tuesday 30th April 2010 the Professional Year performed Hair the Musical at The Albany Theatre in Deptford to rave reviews from all. The Directors Iain Vince-Gatt and Sarah Drummond showed a real flair for understanding the times and issues of the day and managed to portray this with humour and emotion. The audience were a big part of the performance and felt included from the outset. Iain, who also did the Musical Direction, had a tight professional band that set the mood with its rhythms. The witty choreography was fantastically staged by Sarah Drummond. The entire cast worked really hard and kept the performance up throughout the show as they hardly left the stage. Memorable performances of the night were Ashley Martin with his portrayal of Claude – the mixed up Hippy who can’t decide whether to go to war or not, Jak Anderson who played the acid damaged Berger with great timing, Esme Jones as Sheila, the peace protestor, with her spine tingling voice, Kelly Stedman as Ronnie ,who gave a fantastic interpretation of Aquarius and performed a moving duet with Woof with ‘What a Piece of Work Is Man’, and Bertram Levaughn as Hud who, in his own words, is ‘The President Of Love’. The cast were also joined by seasoned professional Matthew Baker who played Woof and helped to add an extra layer of maturity to the piece. For Amy Evans, Jade Brennan and Olivia Hunt this was their last performance for Reynolds as they have all secured jobs in Kos, Crete and Greece respectively. They join Ellis Anderson who left last month to play Cinderella in Disneyland Paris.